Her color philosophy is brought to life in each room in the home. The formal living room has a decadent feel. The richness of the pinks, oranges, and greens vibrantly bounce off of the more muted charcoal colored walls. With gold accents and plenty of textures, the room makes you feel as though you must take your shoes off before entering and carefully place yourself on the couch just right. 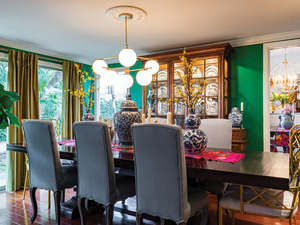 Moving into the dining room, a bold emerald green splashes the walls and takes you to an entirely different place. Chinoiserie pieces and gold candle sticks line the extended dark wood table to create a mood of a lavish dining experience that makes you crave a good glass of pinot and some type of expensive cheese. Stepping into the kitchen and family living room area, a more open concept is set into play (this is also one of the only areas of the home in which you will find the color white). However, the white was very much so a conscious choice on Susan’s part. White suggests the feeling of cleanliness and airiness. By knocking down a wall that once separated these two rooms, Susan is able to prepare food in the kitchen while her kids start their homework at the bar and her husband sits in the living room. “We are in separate rooms, but still get to see each other and that is one area of the house where I like to be able to do that,” Susan says. 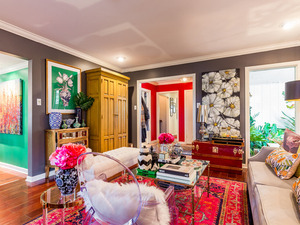 All three bedrooms in the house follow Susan’s color theory closely as well. Both of her daughter’s bedrooms are filled with vibrant colors that relay a playful and fun vibe, while the master bedroom has various shades of plum and blush which come together to create a warm and cozy atmosphere. 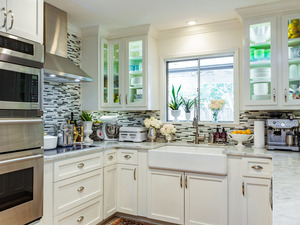 While Susan might not have one particular style throughout the entirety of her home, there is no shortage of juxtaposing themes and elements that come together perfectly in order to create her family’s ideal dwelling place.